We started homeschooling soon after I realized a traditional preschool setting wouldn’t work for my daughter. She had some health problems from being born prematurely, and having her in and out of school just didn’t make sense. Homeschooling worked so well for her that one by one we made the switch for her siblings, too. There’s one thing that has shocked me about homeschooling though: So many people think it’s a herculean task (it’s not!). See, almost every time I tell someone about our arrangement they respond with, “I don’t know how you do it.” I never quite know how to reply because I don’t think there is anything particularly special about my parenting that allows me to homeschool; it’s just a choice we’ve made for our family. I’m not some kind of expert in every subject, nor do I have an unending supply of patience (my children can verify that and so can my husband!). Our days begin when my kids are all awake, fed, and ready to learn. We usually start our work at the kitchen table after breakfast and, on a good day, get several subjects done before someone’s attention span strays or someone else decides to be the class clown for the morning. I’d love to say my kids sit attentively and finish every assignment as they’re told but they are very close in age and like to entertain each other far more than they like to listen to me. The older they get, however, the more disciplined they’ve become with their work. I can see the light at the end of the tunnel for a day when they are all more self-directed in their work. We spend our mornings on all the subjects I can teach them as a group then start breaking off into different activities so I can work one-on-one with them (I use different curricula, in order to cater to each child’s needs). 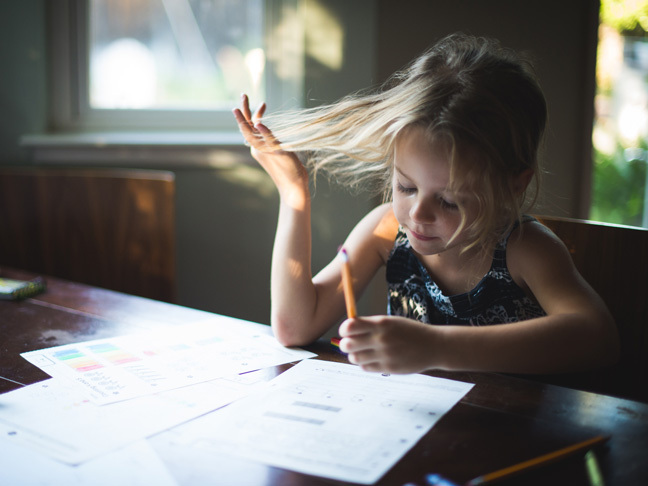 My kids are all very different learners and homeschooling has allowed them to breeze ahead in subjects that are easy for them and go more slowly in subjects that are difficult. I love the fact that we don’t have to move on until a concept is mastered and we don’t have to stay behind once they’ve got it. Because I’m only teaching three kids and we don’t have to allot time for bathroom breaks or lessons in putting away school supplies we are able to finish our work much earlier than a regular school day would end. There are days when we finish by noon or so and I look at the clock and am surprised we’re already done with our lessons. My kids are aware of how much extra time they have to do things they enjoy, and that’s their favorite part of homeschooling. Most days we have some kind of activity that gets us out of the house and visiting with friends. One of the biggest myths about homeschooling is the lack of social interaction; however, if you keep your kids active and in touch with the world there’s no reason their social skills will suffer. We take field trips once or twice a week and there are always classes we can register for in their areas of interest. My kids also participate in all the typical after-school activities. They play soccer and are in a theater group; we will sign up for just about any other activity I can fit on our calendar. The more mainstream homeschooling has become the easier it has gotten for families to connect. Another major social benefit of homeschooling: My children have avoided the bullying and peer pressure that can happen in a typical school environment. My daughter just turned 9 and has no concept of the mean girl behaviors that begin around this age. My boys both feel comfortable doing whatever they enjoy, whether it’s theater or dance or a science club; they don’t feel any pressure to participate in certain things or avoid others to be “cool.” I love seeing them all maintain their own personalities and stay true to themselves. Don’t get me wrong though, homeschooling is not all sunshine and roses. There are the typical sibling arguments and days when I have zero motivation to teach and even less patience. I also have no time alone on weekdays to catch up on grocery shopping or run errands. Every time I get frustrated with our decision to homeschool or begin to doubt whether I’m cut out to do this I’m reminded of the many reasons we’ve made this choice. I also remind myself of the fact that I no longer have to pack school lunches or struggle through homework every night before bed and I’m re-energized to get up the next morning and do this homeschooling thing again.